Jean (Conder) Soule (1919-2008) was born in Brookline, Massachusetts. Jean majored in English at Mount Holyoke College. There she worked for the press bureau, phoning in stories to a young reporter named George Soule, whom she later married. The Soules settled in Springfield, Pa., where they raised three children. When she was not writing about her children, she was writing stories for their amusement, several of which became published books. Her classic poetry is timeless and has appeared in The Wall Street Journal, Good Housekeeping, and other popular publications. 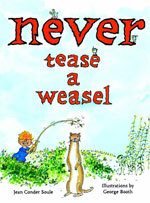 Sometimes light and humorous, sometimes serious and thought-provoking, Never Tease a Weasel continues to appeal to each new generation of parents and children. She died June 18, 2008. This popular Parents Magazine Press title is always in demand at Loganberry, and it's no wonder. The rhymes are winning and fun, and there's even a good morality dose. It was reprinted in 2007 with new illustrations by George Booth of New Yorker fame. While most familiar oldies that come out with new illustrations are disappointing to those who remember the original, we were pleasantly surprised by this new marriage. Booth has a recognizable style, and it fits well here. Both illustrations work well with the dateless rhyme. Captain Kangaroo and His Pals Adventure On Pirate Island. Illustrated by Stanley Wilde and B. Kehoe. MGM Book 1970. Record and book combination put out by Bristol Meyers as Advertising Premium. Good Morning God! A Collection of Poems for Children. Illustrated by Mary Clayton. Unigraphics Wynnewood, 1993. Katy Did. Illustrated by Aliki. Whitman Tip Top Tale, 1962. Katy's First Day, A Going To School Story. [re-issue of Katy Did.] Illustrated by Aliki. Whitman Tell a Tale, 1972. Lenny's 20 Pennies. illustrated by Ken Richards. Parent's Magazine Press, 1962. 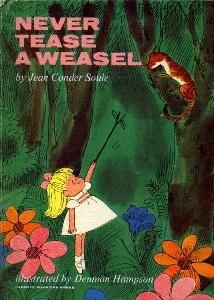 Never Tease a Weasel. Illustrated by Denman Hampson. NY: Parents' Magazine Press, 1964. *Never Tease a Weasel. Illustrated by George Booth. NY: Random House, 2007.